The VideoMic from Rode is a cost effective shotgun microphone that can easily be mounted on a video camera because it features an integrated shockmount that attaches to the camera's shoe. The VideoMic is lightweight, and when mounting on a camera it does not appear in the frame. Its super-cardioid polar pattern attenuates sounds from the sides. The result is a signal that sounds closer to the camera, even when shooting in noisy environments or at moderate distances. A 3/8" thread at the base of the shockmount allows you to use the VideoMic on any standard boompole. With the addition of a longer 1/8" male to female stereo mini-plug cable (like the Rode VC1), and a boompole (Like the Rode Mini Boom), you can radically improve the audio in your video work. 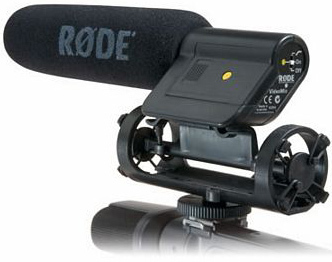 A special 1/8" mini-plug to XLR adapter (the Rode VXLR) is also available to use the VideoMic on a professional camera. Rubber o-rings suspend the microphone on the shockmount and protect against noise due to movement and handling. An attached, coiled cable terminates to a 1/8" (3.5mm) mini output connection. The VideoMic features a condenser element that utilizes a standard 9 Volt battery. The microphone will run for approximately 100 hours on a single battery. • The VideoMic features a condenser element that uses a standard 9 volt battery, which may not be included. Plan accordingly.